Our LOGI-CAL Root Proliferator contains Carboxy Acids- derived from plants. The process results in natural compounds. 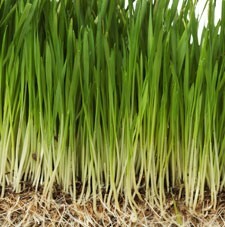 Because they are produced from plants, grass recognizes them and readily absorbs them. The calcium that is part of the compound is very loosely bound in the particle, and is then quickly released and becomes available to the plant. This is unlike other agents that either are bound tightly, or are alone, like pure calcium or lime. The other products take a very long time to become absorbed by the plants, and have very little effect. That's why when applying something like lime to soil it takes so much to have any measurable effect on the soil or plant. Once inside the plant, these nutrients fuel the Kreb Cycle, which stimulates root growth. The addition of calcium in this manner also has the most dramatic effect on ph. Our soils in this area, are not the most conducive to plant health and growth. Our Root Proliferator also affects the nutrients that have been bound up in our soil particles, making them available to the plant as well. Research has indicated that results can usually been measured in the first year of application, unlike the 5-10 years it takes for other soil amendments. LOGi-CAL is also a gypsum product that can be used to prevent or ameliorate salt damage to lawns along roads and walkways. Copyright 2014 Turf King-Hamilton. All Rights Reserved.